I’m a huge fan of starting cheap and going from there. Following on with that thinking, whenever we are asked by a novice photographer “what is the best home lighting equipment for beginners” I immediately point them to places like Ebay. 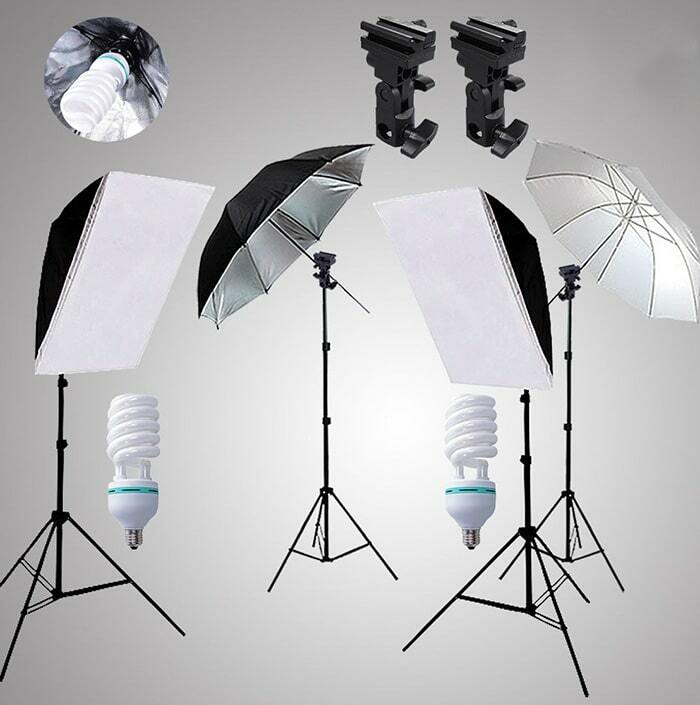 Here you can buy a home lighting setup that will work, for a very affordable price. There’s a few reasons why I would start out with inexpensive gear over the more expensive product. Firstly you need to learn about light in general. Light creates different moods. Learn to control that light so that it falls in the best direction for certain poses. Adjust the strength or softness of light for different circumstances. These are only things you will learn with experience. You will soon realize there are many variables when setting up a home studio. It is very difficult therefore to precisely say that this home lighting equipment is better than that. Simple variables will affect the outcome such as the size of the room, the color of the walls, the amount of natural light entering the room, the source and type of artificial light. Collectively, all the different variables will have a decided effect on the amount of confected light you may need to create a photograph to your liking. Most times you probably have a flash or speed light already in your kit, yet learning home studio lighting seems a daunting challenge. By going cheap you can learn the basics of home lighting without the pressure of having to produce startling results from day one. There are so many different types of equipment, it is really confusing to the novice photographer. You question what and when to use this or that type of lighting. Yet if you start slow and learn at your own pace, you won’t get confused whether you should use a soft box, an umbrella, a snoot or barn door. The above is purely a starter kit, yet it could perform the way you want for many years. You may need to downsize your light bulbs so that your lighting is softer. For example most of the affordable kits ship with 135 watt globes, which may give harsh shadows at close range. Where you can’t physically move the light away from the subject due to space limitations, downsize your bulbs to around 55 watts. At first play with the different gear, umbrellas versus softboxes and the different backdrops. Some photographers prefer green backdrops where others like white or black. Move the lighting around to see the effect of shadows on your subject. Or move it so there are no shadows at all. Starting with this type of basic kit allows you to learn how to use the equipment at home. It doesn’t stretch your budget too far. If you damage something while learning, it doesn’t cost a fortune to replace. Over time you will know if your home lighting needs to be expanded to include other forms of equipment. Time will also reveal if your business can afford upgrading to more expensive options.